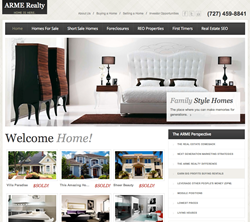 ARME Realty.com releases new real estate SEO content packages for top real estate companies nationwide. If the agency [real estate brokerage] is looking to expand into other avenues, localized targeted custom real estate SEO content is the perfect way to help maximize sales, profits, and commissions. Industry experts consider the rapidly growing ARME Realty.com to be one of the top real estate SEO companies in the country right now, and for good reason. For a real estate company that is struggling, advertising is not just simply a cost. It is a vital investment necessary to survive in today’s media landscape. While the economy’s recovery is slow and sluggish, top real estate SEO companies such as ARME Realty.com are available to assist a real estate agency anywhere in the country. “More and more potential clients who are turning to the internet to buy a home are finding plenty of details there because of the online availability of homes, search options and of course, pictures. It is important, then, to have your agency not only at the top of a search engine results page but also to have that targeted content on this web page so customers can relate your page to their interests,” said Simon Landers, spokesperson for ARMERealty.com. He continues, “Having a top real estate SEO company on your side as a real estate professional is a crucial relationship to have. We develop the custom real estate content required for prospects to find you, and you as a real estate professional simply sit back and handle the new leads that come in as a result”. For more information about ARME Realty.com visit their website or call (727) 459-8841 today.